As should come as no surprise to anyone that follows my blog I love reading and I love designing jewelry so when Erin of Treasures Found announced a challenge and blog hop combining the two it was a no brainer to jump in. My only issue was choosing the book. I actually had narrowed it down to two and ended up only doing one due to a lot of overtime at work. The book I choose is actually a trilogy (is that cheating?) that happens to be one of my favorite books and one of the very very few that I will reread. I generally figure that I have so many books to read as a reviewer that I don't have time to reread books. I also thought that I had reviewed this trilogy and by the time that I found out that I hadn't, I just didn't have time to do so. So I did what anyone would do and turned to google. Here is a review that I found at The Reading Cafe that pretty much sums up the books. 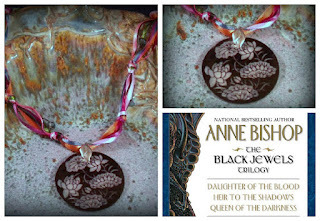 Oh the trilogy that I choose was the Black Jewels by Anne Bishop. I had originally planned on a necklace with crystals the colors of all the jewels of power but again that time thing and the fact that I didn't have all the crystals that I needed. So instead I turned to ribbons and made a necklace that is inspired by a design that I found in Bohemian-Inspired Jewelry by Erin Siegel. So without further ado here is my necklace. So now that you have checked out my humble offering be sure to check out what everyone else has come up with. Not only will you see some gorgeous jewelry but you might find the next book you want to read. Oh and I did mention a contest didn't I? Well I will be giving away the necklace that you see above. A gorgeous piece! I love how your 'plan B' turned out. These books sound wonderful. My favorite book is The Borrowers, from my childhood. 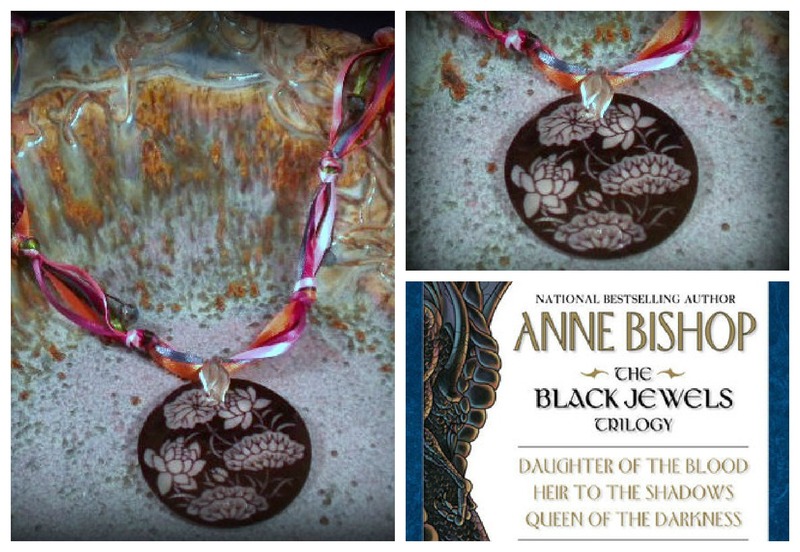 What a gorgeous necklace to go along with a fun read! Love it! Time gets us all! One fantastic pendant, and I love how you put it on knotted ribbons. Fantastic piece! I love that focal! Great to see a piece of jewelry out there already that's inspired by a new release! We can't always follow through on our first idea and I have found that's a good thing - usually! Yours turned out beautifully! Thanks for your nice comment on my blog as well! This is so pretty and pairing it with the knotted ribbon really gives it a feeling of enchantment! Hi Shai, your necklace is very pretty. I like the colored ribbon with the black and white pendant. I had to follow the link and read a review on Amazon. The necklace was eye catching, and I was intrigued... the books sound interesting, I may have to get them. Lovely job! silk ribbons make everything wonderful don't they? I bet this is a joy to wear. I love this series and I have lost track of how many times I have re-read all the books! I think you did a wonderful job with the ribbons capturing the jewels! Ooh, another series of books for me to add to my list! Love the necklace, the silk ribbons really makes it pop! Fun! I have so many favourite books, I can't decide! But hmm, among my alltime favourites are the Belgariad series by David Eddings, all of Raymond Feist's books, and the Harry Potter series. I love this necklace! How beautiful! Your series sounds intriguing, I will have to look it up! Oh! And my favorite book... well... I have so many.. The Three Musketeers by Alexander Dumas, Emma by Jane Austen, The Hobbit by J.R.R. Tolkein, I love the Hunger Games trilogy... eek! So many! !